Kingdom Hearts III‘s Tokyo Game Show 2018 trailer is here! 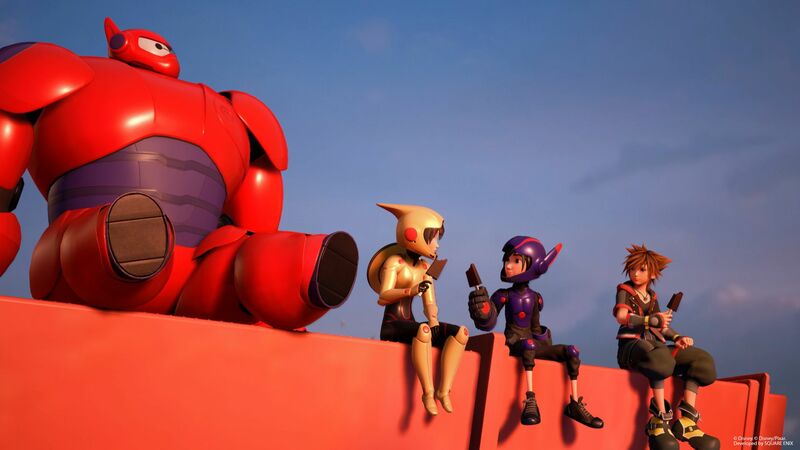 This new video expands on the quick clip announcing its Big Hero 6 content. Let’s dive back in with footage that splices in moments of gameplay alongside the usual cinematic cutscenes. Let’s go back to San Fransokyo! This Kingdom Hearts III trailer opens with a chess match and is followed by a grandiose quote flashing across the screen. It reads, “The light is gathering together. Hearts driven by one oath, one purpose.” Sora, Goofy, and Donald Duck then team up with the Big Hero 6 crew to take on their mutual foes. At this point, this Kingdom Hearts III video cuts to what appears to be actual gameplay. We see Sora run up the side of a building, take on enemies, and even fly on Baymax’s back. When Sora teams up with Baymax, the game momentarily shifts to aerial combat. Like most of the Kingdom Hearts III trailers so far, this one reminds fans of all the franchises they can expect to see in the game. As a result, there are snippets of Frozen, Pirates of the Caribbean, and Tangled tossed into the mix. Other gameplay clips from the footage include segments showcasing close-range combat, racing on a sled, and Sora taking a selfie. Photo mode confirmed? Its more likely that part was taken from a specific task, as a ” 0/7 photos” was stamped in the upper right hand corner of the screen. You can enjoy Kingdom Hearts III when the game releases on January 29, 2019 for the PlayStation 4 and Xbox One. If you’re eager for more Kingdom Hearts content and own a PlayStation VR, download Kingdom Hearts: VR Experience for free this holiday season.